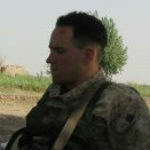 Joe is a Chicago native who served eight years as an infantry rifleman with 2nd Bn 24th Marines. His military awards include a Combat Action Ribbon, Selected Marine Corps Reserve Medal and Iraq Campaign Medal. Joe also worked a government contract as a firearms instructor for the Navy at RTC Great Lakes, tasked with training new recruits. Currently, Joe is pursuing a Ph.D. in physics at the Quantum Nanoelectronics Lab at the University of California – Berkeley.